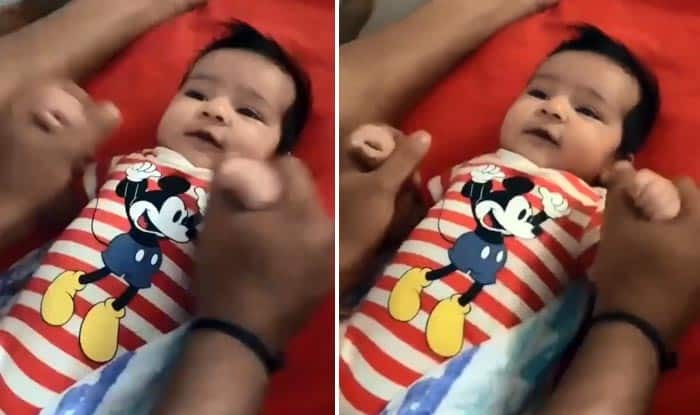 Australia tour of India 2019: India opener Rohit Sharma was seen playing with his newly born baby Samaira. Australia tour of India 2019: India opener Rohit Sharma was seen playing with his newly born baby Samaira. This is the first time the cricketer has given his fans a glimpse of the little baby. It seems like Rohit is shaking the little one fingers as Samaira looks to enjoy it. Rohit Sharma has been playing non-stop limited overs cricket and could be given a break ahead of the upcoming season of IPL and the World Cup. After a grueling three months down under, the Men in Blue are ready to host Australia in a limited overs series, starting February 24. Here is the video where you can get a glimpse of Rohit playing with his baby after coming to India. Baby Samaira was born when Rohit Sharma was in Australia. On getting the news, he took a flight to return to India in order to be beside Ritika and the newborn. Meanwhile, Rohit recently became the all-time leading run-getter in T20Is when he surpassed Martin Guptill to the feat. He also created the record for hitting the most number of sixes in T20I cricket. In all likelihood, Ajinkya Rahane and KL Rahul are set to make a comeback in the side. After missing out on the major part of the New Zealand tour, Kohli and Jasprit Bumrah could also be brought back into the side. It would be interesting to see if Rohit Sharma gets a break as he too has been playing non-stop limited overs cricket recently.